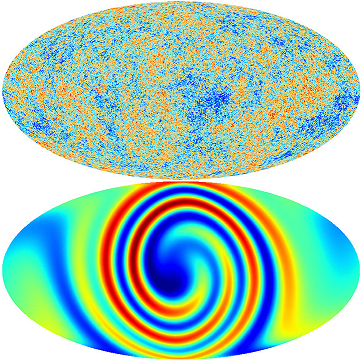 The research involved simulations on a supercomputer where various forms of anisotropic structure and expansion of the universe were introduced in modelled universes. The authors looked for how those would affect any putative patterns that might be observed in the cosmic microwave background (CMB) radiation. The design was to see what would produce anisotropy in the CMB temperature data. See illustration to the right. They found that none of the patterns they produced are observed in the CMB data from the Planck satellite. Ok, so that solves it! The Universe is isotropic and therefore the fundamental assumption for the big bang model—that is, matter is distributed uniformly throughout the Universe, on the largest scales–is correct and hence it validates the choice of the standard ΛCDM big bang model to describe the Universe. Well, no, not actually. Firstly, for that to be true it would have to be assumed that the authors modelled all possible sources of anisotropy in the Universe. It would also have to be assumed that the patterns they generated in their modelled CMB temperature anisotropies were, in fact, indicative of large scale structure in the real Universe. There is no independent way to test that. All that researchers have available to them is supercomputer modelling. So how can you know what the Universe should look like with different types of anisotropic distributions of matter? There are no other universes available except this one, therefore we are always limited by this fundamental uncertainty. The article also mentions the now infamous “Axis of Evil”, first detected in the Wilkinson Microwave Anisotropy Probe (WMAP) CMB data. There it was detected in the quadrupole and octupole spherical harmonic expansion terms of the CMB temperature anisotropies where all, except one, axes of these spherical harmonic expansion terms aligned with a special direction in space, which is even aligned with the plane of our solar system and the equinoxes. But that should not be so in a big bang universe. When the Planck data came in it was expected that such an artefact would not be seen but actually it was still there, even though different equipment run by a different space agency (ESA and not NASA) was used. It was also found in much higher multipole expansion terms and they aligned with this special direction in space. I don’t think that this [“Axis of Evil”] is telling us the Earth is in any way the center of the universe. If it turns out that these strange patterns are in some way lined up with our solar system, I think it’s more likely that my esteemed colleagues who did this experiment somehow have some additional little systematic problem with their measurements that gets contaminated by something to do with the solar system. They’re very smart people. They’ve done a super-careful job, but we’ve seen before in science how you can never think of everything in advance. I think it’s going to be really interesting to see what the Planck Satellite weighs in on this about a year from now because it’s a different satellite. There’s no reason they would’ve made any mistakes the same way that the WMAP team might have made. I don’t want to imply that I think anyone has made a mistake here, but whenever there’s something weird, it’s wonderful if you get a fresh measurement of it. So I’m really keen to see what the Planck Satellite pictures are going to look like, if they’re going to have the same weird alignment, and they’re going to have even better ability to also clean out noise from the galaxy and other sources. So I’m keeping all options on the table until then. Later Tegmark was asked for a comment on this discovery (which may be seen in “The Principle” documentary). He responded saying it showed the “Axis of Evil” in many of the much higher multipole expansion terms. Thus the effect is reinforced, not eradicated. Others have written that the effect is real and not related to some instrumental artefact. It is somehow related to the structure of the Universe. Of course that is dependent on whether the CMB radiation itself is primordial in its origin. In the lead article here, and the referenced research paper, the researchers state that that the CMB imprints the state of the early big bang universe and that it is radiation from the big bang fireball. The evidence for the lack of CMB shadows has not been answered, nor has the “Axis of Evil” been explained. So I would say “You’re not lost in a directionless universe”! There is far too much evidence that points to our place in the Universe as special, even if we are not physically at the centre. There is too much evidence against the big bang story.4 I do not believe in nor promote geocentrism.5 But I do believe God has placed our planet and galaxy in a place that is auspicious (favourable) and definitely we are at the centre of God’s attention. You could say “the Universe revolves around us”, metaphorically speaking of course. A. Cho, It’s official: You’re lost in a directionless universe, Science, September 7, 2016. D. Saadeh, S.M. Feeney, A. Pontzen, H.V. Peiris, J.D. McEwen, How isotropic is the Universe? ArXiv.org, September 7, 2016. Planck shows almost perfect cosmos – plus axis of evil, March 21, 2013. J.G. Hartnett, 20 big bang busting bloopers, August 8, 2016. J.G. Hartnett, The cosmological principle and geocentrism, February 22, 2014.